Though it may not be the most popular sport in the world, there are few personal challenges as grueling or gratifying as running a triathlon. Having to excel at running, riding, and swimming to be successful, this specific kind of race pushes your mind and body to the limit. Of course, you want to make sure that pushing yourself so hard does not result in any actual injuries. That is why when running a triathlon, it is always important to make sure you wear whatever kind of safety equipment is expected. In this regard, the most notable piece of safety equipment would be the helmet. However, there are numerous helmets out there that can be used for triathlons. Figuring out which is the best triathlon helmet for you can be a difficult and confusing task. 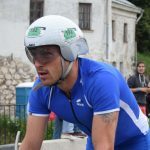 That is why we have put together a list of the 7 best triathlon helmets as well as highlighted what each one does best. Then we provide a helpful buyer’s guide so you can find the best triathlon helmet to suit your needs. 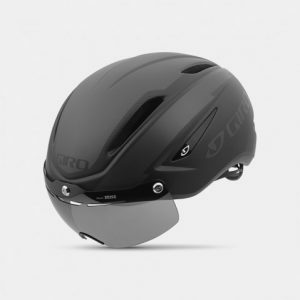 Though it is known primarily as a maker of high-end biking helmets, Giro is one of the more popular triathlon helmet makers specifically because it offers a wide range of products with various features and in numerous types and styles that all perform at the highest of levels. In fact, this dedication to offering a legitimate contender to all consumers is also likely why the brand has put forth one of the least expensive triathlon helmets that we reviewed. Though this is branded as a time trial helmet and its name implies that it is an aero helmet, it might actually be better to consider the Aerohead as a hybrid model. This is because the Aerohead triathlon helmet offers a wide range of features that all focus on ventilation. This is an incredibly unusual course to take for a time trial helmet, though it does allow the Aerohead to exhibit more versatility in regards to target consumer which ensures it will be able to offer something to everyone, despite its low cost. In terms of the Aerohead’s build, it does pretty much everything you would expect plus a little more but it does not necessarily blow you out of the water with loads of innovative and cutting-edge systems like some of the other helmets we reviewed. The shell is made out of in-mold polycarbonate, so you do not have to worry about the padding or lining coming loose and ruining the fit. That said, the lining is arguably one of the more advanced features of this triathlon helmet and when combined with Roc Loc Sair system combine to provide an incredibly comfortable and secure fit. This triathlon helmet also uses as a magnetic Zeiss visor to provide excellent visual protection that is easy to both engage and disengage with the flick of a wrist. Our last Giro is also quite possibly our best. Though it may not technically be the best triathlon helmet we reviewed for all situations, it does offer some specific benefits that are liable to appeal to speed enthusiasts. For instance, this is a time trial triathlon helmet. However, unlike many of the other time trial triathlon helmets, the Giro Air Attack Shield is able to provide all of the expected benefits but at a significantly lower weight than many of the other time trial triathlon helmets that we reviewed. While we cannot say that the Air Attack Shield offers the same kind of balance as some of the other triathlon helmets we have reviewed, there is still plenty to love about both the amount of ventilation provided and the drag reduction. For the former, the Air Attack Shield comes 6 different vents to ensure that your internal body temperature is best able to self-regulate though there are no covers to remove to customize the amount of ventilation received. This also means that you are not able to customize the Air Attack Shield of drag reduction. Sadly, there are few features designed to improve the aerodynamics beyond the shell’s design. 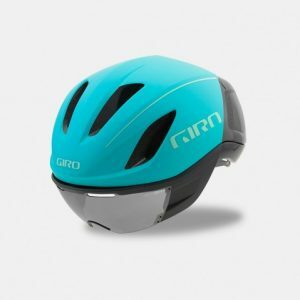 This triathlon helmet also goes a long way to providing an all-around excellent fell which includes both the fit of the helmet as well as its comfort level. For the fit, one of the primary benefits of the Air Attack Shield is the Roc Loc Air closure which ensures that the Air Attack Shield will stay securely on your head without cutting into any of the common pressure points that often accompany a triathlon helmet. On top of that, this helmet also features expanded polystyrene padding with an antibacterial X-Static layer over top to make sure you do not have to worry about bacteria while you ride. If you are not already intimately familiar with triathlon equipment, the Rudy Project might actually seem like a bit of an odd company to make our list. This is because Rudy Project is a brand that actually specializes in protective eyewear as opposed to helmets in particular or even triathlon safety gear in the broad sense. That said, this is still one of the best sports equipment companies on the market within their focus of course in a large part due to their dedication towards progression. While the drag reduction and ventilation may get all of the glamors, the way that a triathlon helmet fits is likely just as important, if not more so, to any sport that relies on stamina to overcome endurance tests. In this instance, a helmet that does not fit properly can become a severe distraction in a situation where you need to be able to focus or see your performance drop precipitously. To this end, the Wing 57 makes it a point to provide one of the most comfortable helmets around with a closure and stability system that put many other triathlon helmets to shame. Another excellent quality about the Wing 57 is how well it balances the reduction of drag it provides with the amount of ventilation it offers. While this is not the most ventilated helmet, the ventilation is solid. On top of that, there are actually a handful of features and covers that allow you to customize the amount of ventilation you receive, providing you the ability to cheat more towards the aerodynamic benefits and drag reduction or ventilation. Of course, you can also customize the drag reduction as well with the magnetic Jetstream tail attachment to keep the wind and air trailing off of your body. Louis Garneau is one of the most trusted brands in the world of biking for a few reasons. Arguably one of the biggest reasons that bike riders trust the brand is because it was started by an Olympic-level bike rider who understand what it takes to get the best performing bike helmet. Of course, professional cyclists have a tendency to prefer the classic aero design, which is why it should come as little surprise that the Louis Garneau came in on our list as the best aero triathlon helmet. To be clear, not everyone will want a classic aero helmet for the biking leg of their triathlon. However, if the biking leg is either your strongest or your weakest leg of the race, then you might seriously want to consider using an aero helmet. For the Louis Garneau, this begins with the incredibly large, swooped back design. It is worth noting that the P-09 is actually just a modified Vorttice helmet that has been improved. One of the major design improvements comes from the front of the helmet. This divided front looks like the surface of a golf ball and actually provides the Louis Garneau some of the best laminar wind flow on our list. 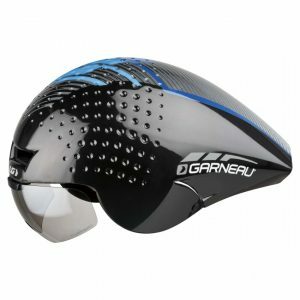 Since aero helmets are not known for their ventilation, it is all the more surprising that Louis Garneau does a fairly decent job in this respect. First, the padding of this triathlon helmet uses padding not found on any other others on our list. Specifically, the use of the Icefil padding allows this helmet to keep your head cool and your internal temperature down despite not having the best ventilation. That said, this is another triathlon helmet that makes it a point to give the wearer control by offering a couple different modifications on the Louis Garneau that allow you to control exactly how much drag you want to reduce or how much additional ventilation the helmet provides. 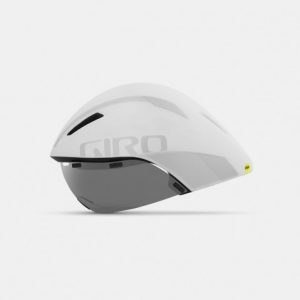 Popping up on our list again, Giro has put forth arguably the best traditional road helmet that we have seen. Though, it should be noted that there is a good chance you might not be able to identify the Vanquish as a traditional road helmet considering its mostly closed design. That said, you should certainly not discount the vanquish as it offers a full suite of the expected features even if it does come at a slightly higher cost and is also one of the heavier triathlon helmets that we reviewed. This quality often gets overlooked for triathlon helmets, but the vision is an incredibly important factor to consider when selecting a helmet for the biking leg of a triathlon. Generally, this is seen as a feature that you either check off or you do not, but there is little variation. With the Vanquish, it not only checks off the box, but it goes a step further to appeal to different wearers. First, this triathlon helmet features an optional Zeiss visor that connects magnetically. This allows for easy removal if it is not necessary. On top of that, this triathlon helmet also comes with eyeglasses grips to make wearing both glasses and the helmet comfortable. Another interesting quality about the Vanquish is its build. Because it is a road helmet, you should expect it to be a bit different in construction than the other helmets, but the Vanquish once again blazes its own trail with this quality as well. Specifically, the polycarbonate shell of the helmet uses four interlocking pieces to provide ample availability of customization as well as impact resistance. The shell is then in-molded with expanded polystyrene foam to offer more protection. However, this foam is applied in layers which once again offers more impact resistance than simply a molded foam padding. 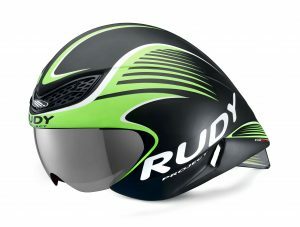 Rudy Project makes another appearance on our list, this time for the best hybrid triathlon helmet. Though, if we are being honest, the Boost 01 could very well be the best overall performing triathlon helmet that we reviewed. This is because there are few triathlon helmets that we saw which can truly compare to the Boost 01 along with all different factor considerations. While it may not be the best at anything, it often places high in all qualities. It might seem an odd place to put additional resources, but the padding of the Boost 01 is one of its legitimate benefits in that it provides benefits to many of the other considerations. The first point of interest for the boost 01’s padding is the Dry Foam. This padding will whisk the sweat from your head without absorbing it, allowing you to stay cooler without having to worry about bacterial build-up. Of course, if you are worried about bacteria at all, you can lay those concerns to rest with the inclusion of the antibacterial Static-X padding on top of the Dry Foam. Another reason this may well be the best triathlon helmet is that it so seamlessly provides both solid drag reduction as well as ventilation. Among triathlon helmets, there are truly few that can pull this off effectively, but the Boost 01 does so and makes it look easy. First, the design of the helmet is balanced in all directions, but it offers special benefits to variable winds. Specifically, this triathlon helmet features a dorsal ridge that provides plenty of drag resistance whether facing forward or from crosswinds. Even better, this is another triathlon helmet that features the vortex killer system which generates significant ventilation in and around the wearer’s head. Of all the brands on our list, Kask may be the least well-known. However, this brand has not allowed the larger, more prestigious companies to completely push it out of the market as this triathlon helmet offers some legitimate benefits a couple of which that it is actually the best for. That said, the undisputed winner of the lightweight competition goes to the Kask Protone which makes it great triathlon helmet for those who are a little new to the sport and may not yet have completely developed their stamina. Though this is technically considered a hybrid helmet, the Kask is by far one of the more traditional hybrid style helmets that you can find. 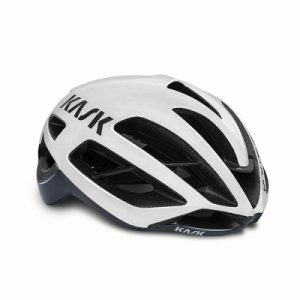 In this instance, the Kask most closely resembles a road helmet, but there are a few design features that take it out of the category and inherently designate it as a hybrid. Still, much like a classic road helmet, the Kask places extreme importance on ventilation an offers the most open headspace that we saw. While this may increase drag a little bit, it also means that you should have no concerns about overheating. Another area where the Kask actually improves upon the designs and conventions of other brands that are far more prestigious is in terms of cleanliness. When you are riding for over an hour trying to achieve the fastest time, you will sweat buckets. Thankfully, the Kask comes with a couple of features to make sure this is not an issue. First, the 3D DRY padding uses a multi-layered cell design to trap moisture. On top of that, it features padding which is both antibacterial specifically and antimicrobial in general. Finally, to make sure none of the sweat causes issues later, virtually all of the padding is washable. This is either the most important factor for a triathlete or something they simply must account for. The weight of the helmet will play a large role in which helmet you choose in a big part due to the fact that it is one of the few pieces of equipment that you will wear which adds legitimate weight to your body. Granted, triathlon helmets are generally as light as is reasonable, but that weight is carried on top of your head which makes it impact you even more. Of course, the weight can affect more than simply how much and quickly it saps your stamina. The weight of your triathlon helmet may also affect the fit, safety, and ventilation. For the latter, this is because a heavier triathlon helmet is liable to sit more heavily atop your head without various suspension features to account for the weight. From a safety standpoint, heavier helmets are usually a bit safer as that weight is often made up of padding and protective foam. As far as the fit is concerned, this will hinge as much on the balance of the helmet as the actual weight. In this case, if the helmet is front or back heavy, it can slip while you ride though this weight may actually also serve to keep the helmet firmly in place as you ride, even if you fall or must make quick reactions to avoid doing so. 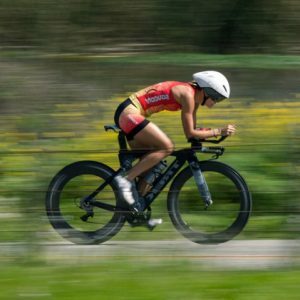 Of the big three primary factors to consider when purchasing a triathlon helmet, this one might actually be the most important to your personal safety. This is because most of the legitimate triathlon helmets are roughly equally good at protecting your noggin from an unexpected tumble. However, the other big safety risk of triathlon at least for the biking leg of the race is a legitimate risk of overheating and maybe even suffering from heat stroke. That is why the ventilation of your triathlon helmet needs to be substantial. Of course, you will definitely have to consider what is more important among different qualities and to what extent you may be susceptible to overheating. Depending on the type of triathlon helmet you opt for, you can expect plenty of ventilation though it may also ultimately slow you down a bit or little ventilation which will provide just a smidge more speed. It should be noted that keeping your body temperature lower will actually allow you to race more efficiently and use less energy, so it is not as a simple as an if/then situation. This is the last of the big three primary factors to consider, though it should not be seen as the least important. Instead, these big three factors are better understood as priorities. Depending on what quality of the bike leg you need the most assistance with, you should focus on optimizing one of these three qualities. For aerodynamics, the whole point is to provide a variety of design features that will ultimately let you ride faster while also using less energy. While this can technically help you keep your body temperature a tad lower, it is no substitute for ventilation. This is accomplished by reducing the drag of wind and air resistance, so you do not have to expend as much energy while riding. Regardless, a triathlon helmet’s aerodynamics can be improved with a few notable design changes. First, a large front of the helmet helps blunt the drag while sweeping tails have also become popular for drag reduction. That said, plenty of triathlon helmets have been experimenting with short tails to reduce the weight without increasing the drag. 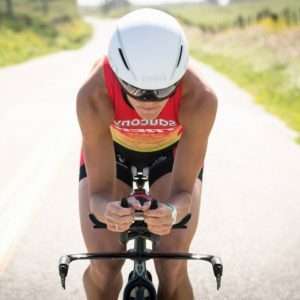 Another design feature that is quickly gaining traction among triathlon helmet manufacturers is a dorsal ridge to help reduce the drag from crosswinds. The type of triathlon helmet refers to the overall shape and design of the helmet as well as which features are favored over others. While there is actually an emerging style of helmet that is considered the “triathlon style,” there are still plenty of racers who either prefer to maximize the helmet’s advantages towards a single stage or perhaps they switch out gear between the different events. Regardless of the motivation, this has led to a wide variety of different helmet types that are commonly used to run triathlons. That said, it is important to remember that there is no “right” type of triathlon helmet. While there are definitely some that you probably should not for every event of an entire race, there is still more than one type that can functionally serve in that capacity. As such, the type of triathlon helmet that will best serve you will depend on how particularly you want to run the race or if you prefer instead to simply go a minimalistic route. Road – Were it not for the serious investment in research and development as well as the similarly serious investment that you will have to put down to use it, you might naively call a road helmet a “bike” helmet. While this type of helmet is definitely designed to be worn while riding a bike and is even often designed specifically for professional biking competitions, the road helmet has been made and remade so many time in so many different ways over the years that many of them serve fairly well for other extreme or endurance sports. In fact, this was one of the more popular types of a helmet for triathlons before the sport spawned its own niche market. In fairness, road helmets are a bit of a holdover from when few helmets were being designed explicitly to maximize the qualities that will help racers win triathlons. As such, many of their features can vary a bit more than with the other types of helmets. For instance, there are road helmets designed to maximize the ventilation, and in doing so are some of the best-ventilated helmets. On the other hand, some prefer to take the overall approach and improve as many features while not really standing out above the competition in any single one of them. Aero – Out of all the different types of triathlon helmets, few are as specialized in terms of its purpose as the aero helmet. This is definitely a helmet designed to be used by a racer that utilizes gear transition throughout the competition. The reason is twofold: first, the aero helmet has a tendency to weigh a little bit more than the other types of helmet, and second, the aero helmet only provides its primary benefit when you are traveling at high speeds. Unless you are sprinting like Usain Bolt the whole course, you are unlikely to see the aerodynamic benefits from an aero helmet while on foot. That said, for its purpose, there are few helmets available that are as effective at their intended task as an aero helmet. The reduction of drag with aero helmets is significant and can often approach double digits. This allows you not only to ride faster but to expend less energy doing so. Granted, the design of some of the best aero helmets does leave it in a bit of a bind if you want to use the helmet while running other portions of the race, but there are few that can truly compete with the aero helmet in the bike riding portion of the event. Hybrid – If the name does not give it away, this kind of helmet is designed to accommodate a wide variety of tasks. What this usually turns into is a situation where hybrid helmets are jacks of all trade. While they may not necessarily be the best at any given task, they are actually good enough at all of the individual tasks that it bears considering. Sometimes multipurpose items simply drop the standards to be equally good at all of them. With hybrid helmets, on the other hand, the drop is fairly slight and only to account for other necessary qualities. One of the biggest dichotomies that hybrid helmets seek to bridge is between ventilation and drag reduction. Keep in mind, half of the hybrid is the quasi-aero quality of the helmet. However, the hybrid type of helmet also seeks to eliminate the awkwardness of the aero design and looks a bit more like an advanced road or time-trial helmet. Hybrid helmets are also far more likely to have entirely open ventilation and place a higher priority on ventilation than aero helmets do. That said, the more ventilation than a hybrid helmet provides generally the less drag reduction it provides. As such, you often must choose between your internal temperature and your maximum speed and efficiency. 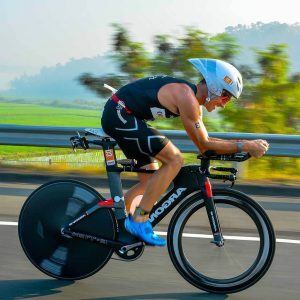 Time Trial – The time trial triathlon helmet takes the same approach as some of the other type on this list: specialization. That said, the specialization of the time trial helmet could make it a potential candidate to be effective in a variety of contexts. Unfortunately, you must be a particular kind of racer to choose this helmet. Specifically, you must be one of the most enduring racers around-even beyond the extreme stamina required simply to compete in a triathlon in the first place. This is because the time trial helmet comes with more disadvantages due to its extreme focus. To this end, the time trial helmet is focused on providing the best aerodynamic benefit during the race compared to any of the other helmet types. Even the aero helmet may sometimes have to keep up with the time trial helmet. Of course, this has as much to do with what the time trial helmets lack as what it has. In this case, we are referring to the copious absence of serious ventilation with time trial helmets. To make matters worse, this is also often the heaviest type of helmet available forming a one-two punch to sap your energy. As such, it is often reserved for individuals who expect to make excellent time during the biking leg of the race. 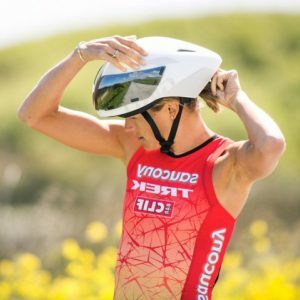 While the closure of most wearables is fairly important if for no other reason than to avoid an embarrassment, it is arguably far more important for triathlon helmets than most other worn articles. This is because the triathlon helmet closure does more than present a faux pas or reduce the comfort. The closure is necessary to both provide a solid fit as well as keep your lid on top of your head. To this end, manufacturers of high-end triathlon helmet have shown surprisingly critical focus in identifying how to improve this part along with all fronts. That said, the integration of the closure with the various stabilization systems on the market has allowed the closure to become a full-fledged design benefit. This primarily involves the closure system being a part of the fit with the lining. That said, not all closure systems are designed with the same intention. Some closure systems aim to take into account that you will not necessarily use the helmet for the entire race in every competition. As such, those helmets break away from the pack and use a magnetic locking system. While this can function serviceably well, it is nowhere near as secure as the more common snap locking system. In fact, you should actively avoid a magnetically locking closure system if you expect to compete in events where the weather regularly features strong winds. This consideration is not nearly the most important, but it may sway you depending on what kind of competition you are racing. Essentially, certain types of races might actually call for a different material in an ideal sense. That said, few races are designed such that they practically require a specialized material or are vastly improved by it. From a general standpoint, however, your best bet is to simply go with polycarbonate. This material is incredibly durable and so impact resistant that is has been marketed as “shatterproof” glass and serves as the material for a wide variety of high-end sunglass lenses. For a triathlon helmet, polycarbonate more or less lives up to its shatterproof billing and serves for arguably the most important piece of safety equipment for a triathlon-though taking a serious tumble may snap off any protuberances. Outside of polycarbonate, the next most common material used for triathlon helmets is carbon fiber. While this material is superior to polycarbonate in virtually every meaningful comparison, it is also significantly more expensive than polycarbonate as well. As such, unless you are already a professional triathlete, there is little reason to invest well over $500 into a piece of equipment you use as a hobby though a few of the helmets reviewed do actually qualify for such a designation. As we can see, there is not really a single triathlon helmet that will satisfy all racers equally. Some races might not find the biking leg of the race to be their strong suit and opt for a triathlon helmet that will help them achieve the quickest time possible while others may simply need to either feel comfortable or reduce their internal body temperature with maximal ventilation. 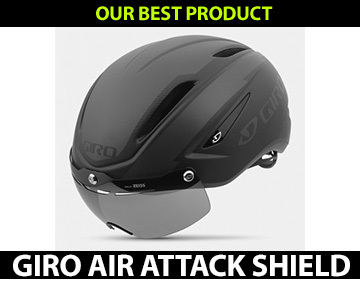 Since a triathlon is a race, one of our first recommendations will be the Giro Air Attack Shield. For one, this is one of the lighter triathlon helmets that we reviewed and only 10g heavier than the absolute lightest helmet on our list. On top of that, this helmet does feature more ventilation than you might otherwise expect from the helmet type and also provides a Zeiss visor as well as a fully magnetic locking system. 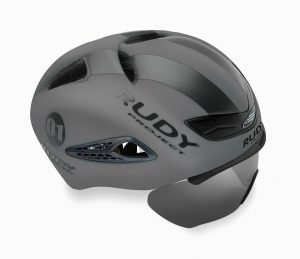 Of course, if you are looking for a triathlon helmet that will provide a wide range of benefits instead of focusing primarily on one or two, we recommend the Rudy Project Boost 01. This hybrid type of triathlon helmet is one of the official helmets of the USA triathlon team in a large part due to its design with balances serious ventilation on top of decent drag reduction. On top of that, this is also the second lightest helmet we reviewed and comes with an optional Zeiss visor. Can these be used for tandem bikes? Morgan, yes, these helmets are used for tandem bikes.